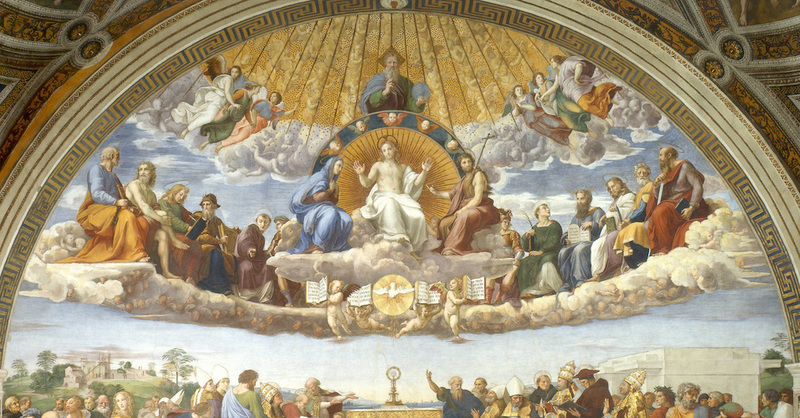 To continue our series on the different parts of the Mass, we will now examine the beginning of the Liturgy of the Eucharist and in particular, the "Sanctus" or "Holy, Holy, Holy." We now enter into the second part of the divine liturgy, which is called the "Liturgy of the Eucharist." This is the part of the Mass where the words that were spoken at the Gospel become Flesh in the Holy Sacrament of the Eucharist. As the GIRM narrates for us the significance of this part of the Mass, "At the Last Supper Christ instituted the Paschal Sacrifice and banquet by which the Sacrifice of the Cross is continuously made present in the Church whenever the priest, representing Christ the Lord, carries out what the Lord himself did and handed over to his disciples to be done in his memory. At the Preparation of the Gifts, the bread and the wine with water are brought to the altar, the same elements that Christ took into his hands. In the Eucharistic Prayer, thanks is given to God for the whole work of salvation, and the offerings become the Body and Blood of Christ. Through the fraction and through Communion, the faithful, though they are many, receive from the one bread the Lord's Body and from the one chalice the Lord's Blood in the same way the Apostles received them from Christ's own hands" (GIRM). At the start of the Liturgy of the Eucharist there is the Preparation of the Gifts, where the gifts to be sacrificed are given to the priest. In historical context, members of the early Church would bake the bread and create the wine needed for the celebration. They would then bring those elements and offer them to the priest. This is why we currently have the custom in the Church to select representatives from the congregation to present the bread and wine to be consecrated, symbolizing the offering of ourselves to God. After the gifts are prepared at the altar by the priest, the "Santcus" (Holy, Holy, Holy) is intoned and all kneel in preparation for the greatest miracle of all times: God humiliates Himself so much as to dwell in a simple piece of bread and a small chalice of wine. Historically, "not every one of the ancient liturgies knew this [particular] hymn, although its institution is attributed to St. Sixtus I who, as Pope, introduced it into the Mass in the second century" (TM). In the current translation of the Mass, the Sanctus has a slight revision that better expresses the mystery that it is meant to teach us. "The opening line of the Sanctus is taken not from a hymn book, but from the angel's worship of God in heaven. In the Old Testament, the prophet Isaiah was given a vision of the angels praising God, crying out: 'Holy, holy, holy is the LORD of hosts' (see Isaiah 6:3). The word 'hosts' here refers to the heavenly army of angels. When we recite 'Holy, Holy, Holy Lord' in the Mass, therefore, we are joining the angels in heaven, echoing their very words of worship. The previous translation of this prayer referred to the Lord as 'God of power and might.' In the new translation, we address him as 'Lord God of Hosts.' This more clearly echoes the biblical language of the angels in Isaiah and underscores the infinite breadth of God's power" (TM). When we said "God of power and might," it was more abstract, while when we say "Lord God of Hosts," it is more concrete and specific, referring to the heavenly "hosts" of angels, archangels, principalities, virtues, powers, dominions, thrones, cherubim and seraphim; in other words, the entire heavenly army! This ancient hymn prepares us for what is about to unfold and reminds us that we are never alone at Mass. The angels surround us and sing with us a "hymn of praise!" Mass is a meeting place of Heaven and Earth and so we must prepare ourselves for the great mystery that occurs in front of our eyes!